Probably best known for being the guitarist with Canterbury psych-prog legends Gong in the 1970s, Steve Hillage has had a long and successful career. It’s a great shame that while bands like Genesis and Yes have always been viewed as legends of 70s progressive music (though often derided by the press), Hillage has remained no more than a cult artist – his solo output criminally ignored in comparison. While his first solo release ‘Fish Rising’ sold quite well due to its coinciding with his time in Gong, Hillage’s second release ‘L’ would be one of his most enduring, since it contains his cover (and arguable the definitive version) of Donovan’s ‘Hurdy Gurdy Man’. It’s his third album, however, which I feel best represents Hillage as both a great musician and arranger. Recorded in the US, ‘Motivation Radio’ was produced by Malcolm Cecil – inventor of TONTO (The Original New Timbral Orchestra), an electronic instrument, briefly popular in the mid 70s. As expected, he appears on the album with his beloved TONTO, but never in any great capacity. (TONTO was the first modular synthesizer, bought to prominence by Stevie Wonder. While it represented a great leap forward for electronic music, it wasn’t especially practical, since it was the size of a static caravan). With far less of a reliance on the cover material that had been a huge focus on ‘L’, his 1977 release ‘Motivation Radio’ still features Hillage’s signature glissando guitar work at its core, but in terms of construction, it’s a much tighter collection of songs. Heavily processed guitars open the album with the upbeat ‘Hello Dawn’. Electronic and acoustic drums back Hillage’s multi-tracked vocal as he greets a new day with optimism. A simple message of making the best of the new day – and the future – is coupled with a fantastic arrangement; Hillage’s multi-layered guitars have their signature sound. During the vocal sections they are used as striking punctuation; during the brief instrumental break at the songs close, their chorus of sound dominates. At just under three minutes, its brevity is a complete contrast to the extended jams of most of Hillage’s previous work. 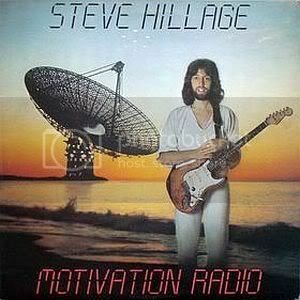 For ‘Motivation’, the band opts for a funk groove; with brimming confidence, the music is the perfect match for Hillage’s deliberately positive lyrics. Everything here is musically perfect, with absolutely no padding or improvisational qualities. While Hillage’s simple, driving riff is the dominant force, Miquette Giraudy’s keyboard fills are supportive, Joe Blocker’s drum patterns are superb and Reggie McBride’s bass work shows complexity without losing sight of his anchoring role. With a tight drum intro which almost rivals Pierre Moerlen’s work on the Gong track ‘Oily Way’, ‘Light In The Sky’ is great from the off. Constructed around a classic 70s riff, Hillage’s band hit a really solid groove. Many years later it’s lyrics about aliens could be viewed with suspicion and Giraudy’s heavily French accented vocal interludes give an air of quirkiness which isn’t always quite so welcome, but musically, it’s absolutely top drawer stuff. (Those in the UK will recognise this as being the theme for the Channel 4 programme ‘The Friday/Sunday Night Project’ with Justin Lee Collins and Alan Carr. I have my suspicions that Collins was responsible for this choice of theme tune). ‘Radio’ has a rather more spacious vibe. Hillage lays down a slightly jazzy guitar line in the intro, even reprising the closing moments of ‘Light In The Sky’ in the process (it would have been better had ‘Light In The Sky’ segued straight into this; it certainly sounds like it was designed that way, despite there being an obvious track break). The rest of the band joins gradually, with Reggie McBride’s bass high in the mix, Joe Blocker’s drums laid back but never losing focus and Giraudy’s blankets of keys hovering somewhere in the back. A brief solo played by Malcolm Cecil on TONTO is very “of the moment” (though far from jarring or awful by any means), before Hillage’s lead vocal drifts in. With a more relaxed pace than the preceding material, ‘Radio’ has an ethereal quality far more in keeping with some of his earlier work from ‘L’; though that’s not to say it’s out of place on this album by any means. For fans of Hillage’s sweeping guitar solos, it’s certainly a high point. Likewise, his playing is exemplary during the instrumental number, ‘Octave Doctors’. There’s a typical spaciousness here and while the rest of the band turn in decent performances, Hillage really shines with plenty of glissando and vibrato. Possessing a tone more beautiful and distinctive than so many guitarists, he deserves as much worldwide recognition as Eric Clapton, David Gilmour, Jimmy Page and Jeff Beck for his work. The ballad ‘Wait One Moment’ isn’t as instant as some of the album’s material, but repeated listens show it to have some brilliant qualities. Hillage’s soft vocal is very natural sounding against McBride’s unassuming bass runs and Blocker’s drums, which here adopt a style comparable to those of Pink Floyd’s Nick Mason (whom would work with Hillage the following year on the album ‘Green’). As is often the case though, it’s Hillage’s masterful soloing which provides the tracks greatest moments, his soaring and other-worldly approach not falling far short of genius. ‘Saucer Surfing’ provides the album with its most spiky arrangement. Hillage delivers an overly wordy verse (it’s lines all too long on purpose – each one scanning a line and a half or thereabouts), but even so it works, giving the piece an edginess and sense of urgency. Hillage’s riff is a simple one, based completely in the straight-up rock mould and combined with the bass and drums, this could have been just as easily played in the power trio format. Granted, once again, the lyrics regarding space exploration and “reality gypsies, surfing the vibrations with our minds” are certainly a product of their time, but I’m certain Hillage meant no harm and it all seems very heartfelt, even if the intentions of these reality gypsies seem really far removed from reality as we know it. ‘Searching For The Spark’ features a (then) futuristic base laid down by Giraudy and Cecil’s synth work. While the guitar solos here are superb, there’s not much else here of note. With the synths and TONTO dominating, Blocker’s drum work is aggressive in an attempt to create a balance between progressive rock and electronica and Hillage’s vocal sections aren’t so tuneful. A cover of ‘Not Fade Away’ closes the album. Here, the more traditional, punchy three chord arrangement is represented by a loose groove, driven by Blocker’s drums, overlaid with trippy keyboard sounds courtesy of Giraudy, coupled with some quirkier sounds by Cecil on TONTO. Hillage’s vocal sounds a little uneasy here, but he makes up for it with some stunning guitar playing during the intro, largely based around the riff he’d written for Gong’s ‘I Never Glid Before’. It’s one of the album’s weaker numbers, not quite living up to the promise of that opening riff, but regardless of this, it was chosen as the album’s single release. Hillage’s next album ‘Green’ has a similar feel in places, though has a tendency to wander into the kind of meandering present on ‘L’. However, it would be his 1979 outing ‘Rainbow Dome Musick’ which would have the biggest impact on Hillage’s post-Gong career. Containing two twenty minute suites of electronic music performed by Hillage and Giraudy (one for each side of the original LP), the album was way ahead of its time. Although under-appreciated at the time of release, it gained a new audience years later. Legend has it that during his time out of the spotlight, Hillage wandered into the chill out room at London club Heaven to hear parts of the album being played by Alex Petterson of The Orb during his DJ set. This led to Hillage not only collaborating with The Orb, but also forming his own ambient electronic act, System 7 (which, like ‘Rainbow Dome Musick, was a duo with his wife and long-term musical collaborator, Miquette Giraudy). Hillage had gone from being a cult 70s artist to being one who had not only relevance, but also made a huge impact on the 90s chill out/ambient electronic scene. If you’ve not checked out any of Hillage’s albums and have a liking for great guitar playing and hippie ideals, then the first four each have their strong moments. While ‘Fish Rising’, ‘L’ and ‘Green’ can feel a little demanding on the listener at times, ‘Motivation Radio’ rarely wanders into musical self-indulgence, making it an unheralded classic among Hillage’s recorded works. This entry was posted in 70s, prog by Real Gone. Bookmark the permalink.